In stock -This product will ship today if ordered within the next 6 hours and 44 minutes. Cinnamon essential oil, also referred to as Ceylon, Madagascar, Seychelles or true cinnamon, has a sharp and sweet, spicy, musky smell. Cinnamon oil is beneficial due to its calming and warming properties. Its festive, spicy aroma works well in candles, diffusers, oil burners, incense and air sprays. When used on the skin, cinnamon may take the sting out of bites and act as an astringent. 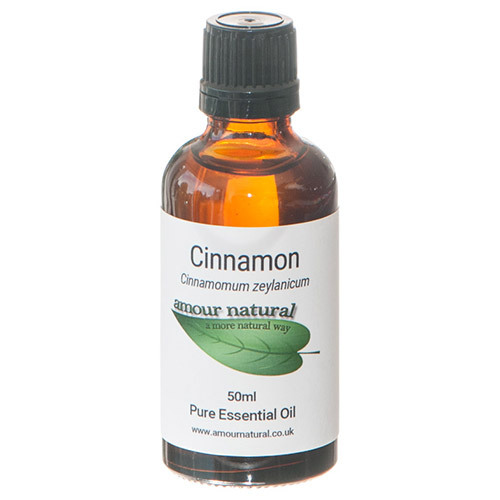 However, cinnamon essential oil can be irritating to skin so use with caution and always dilute thoroughly. Amour Natural uses cinnamon essential oil that is steam distilled from the leaf as it yields a more pleasing and delicate oil. Cinnamon essential oil blends well with benzoin, cove, frankincense, ginger, grapefruit, lavender, sweet orange, rosemary, thyme and pine. Below are reviews of Amour Natural Cinnamon Pure Essential Oil - 50ml by bodykind customers. If you have tried this product we'd love to hear what you think so please leave a review.